Sidbury Vineyard can be found nestled within the Roncombe Valley just on the outskirts of Sidbury Village. 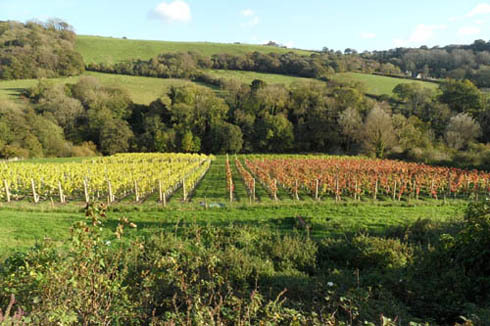 The vineyard lies within the scenic East Devon Area of Outstanding Natural Beauty, currently taking up 2 acres of a southerly facing slope, protected from the cooler winds by the natural contours of the valley. Our wines are made purely from grapes from Sidbury Vineyard. With only a relatively small plot to manage the quality of grapes can more readily be guaranteed and during harvest only those bunches meeting certain criteria are selected and picked. Our wines have been submitted for and passed the official UK wine quality scheme, the English Regional Wine PGI (Protected Geographical Indication) which involves independent analysis and professional tasting. In addition, in order to achieve this status, the wine must be low in sulphates. Sidbury Vineyard wines are fresh and fruity, with a real English character. We have chosen styles of wine to suit the cool climate with a future emphasis on making sparkling wines. All grapes used in our wines derive entirely from Sidbury Vineyard and with smaller quantities being used we can ensure a higher quality is achieved. Each vine requires intensive hands on care throughout the year and then the grapes are carefully selected and handpicked. We welcome volunteers to join us! Please contact Andrew and Rebecca on 01395 597786 or email sidburyvineyard@gmail.com.